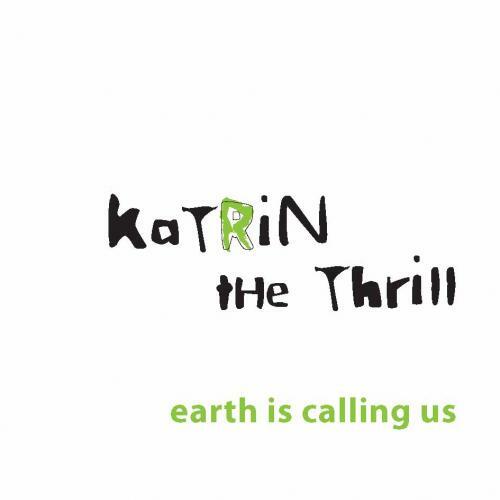 Κυκλοφόρησε το νέο EP της Katrin The Thrill με τίτλο "Earth Is Calling Us". Μέρος των εσόδων του album θα χρησιμοποιηθούν για την αναδάσωση καμμένων δασών. Κυκλοφορεί από την εταιρεία Incense (η οποία ανοίξει στις εκδόσεις Λιβάνη). Η Katrin έγινε γνωστή το 2007, από το Coca Cola Soundwave με το κομμάτι "If You Believe In Dreams". Ακολούθησαν πολλές συναυλίες (Terra Vibe, Gagarin, θέατρο Βράχων, Bios κ.α.). Katerina Panopoulou started creating music as a singer, when a teenager with friends, and that's when she got the bug. One year later when the band broke up, she got herself her first electric guitar and wrote her own songs. In 2001 she moved to England to study music. Two years later, back in Greece she teamed up with guitarist Gina Dimakopoulou, violinist Katerina Michailidi, bassist Iakovos Siaparinas, drummer Dimitris Panagiotopoulos and formed the band "Dementia Praecox". After many live performances in Greece and several changes to the band's members, she moved to London to further her studies and along with Gina changed the name to "Garbo". At the same year she performed live in London as a solo acoustic artist. In 2007 under the indissoluble name of "Katrin The Thrill", she participated in the "Coca Cola Soundwave" competition, and won a place among the five best music acts. The video clip of the song "If You Believe in Dreams" was shot and the track was included in the "Music on the coke side of life" compilation. For the next two years "Katrin the Thrill" performed in Greece: "Terra Vibe", "Gagarin 205", "Vrachon Theater", "European Music Day", "Bios", "Athens Gay Pride", "Festival Against Racism", "Indie Free Festival" and played as support band for "Electrelane", "Manic Street Preachers" and "Greg Dulli". In 2009, following the devastating fires that swept through Greece, as well as many other places around the world, the concept for "Earth is calling us" EP was devised, and the need to take action and help reforestation was fully realised. In December 2010, the EP is released as her first solo project with Gina playing the guitar, Maria Roka the bass and Tolis Toleas the drums. 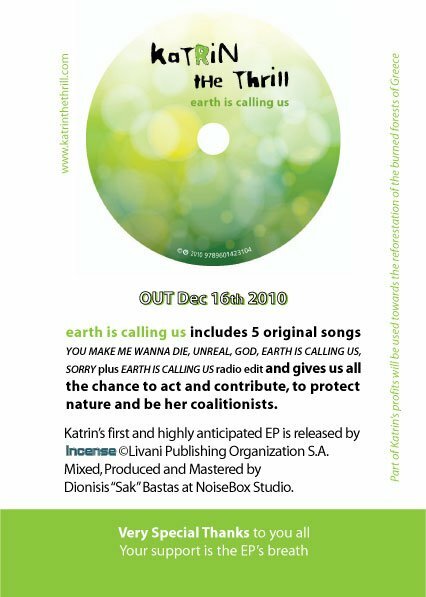 Part of Katrin's profits of "Earth is calling us"EP will be used towards the reforestation of the burned forests. Tags: Katrin The Thrill, Soundwave, coca cola, αναδάσωση.